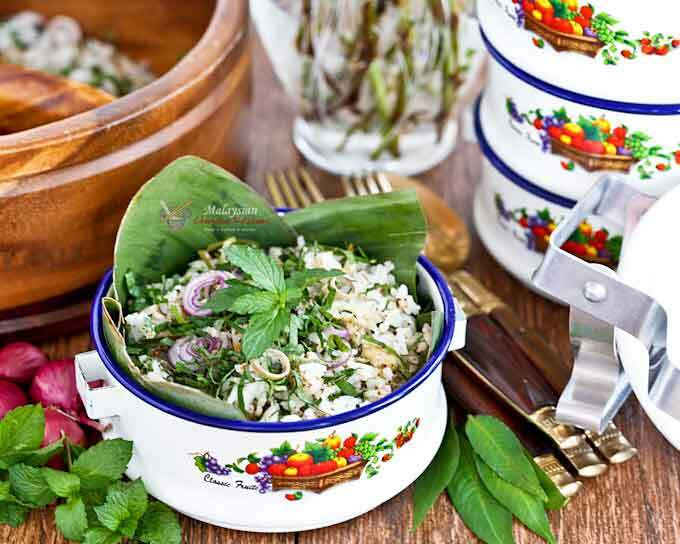 Nasi Ulam (Nyonya Herb Rice) is probably one of the strongest evidence of Malay influence on Peranakan (Straits Chinese) food. The use of raw herbs mixed into rice is unknown in the original Hokkien cuisine from which many Baba Nyonyas derive from. It has more in common with the Malay Nasi Kerabu (Kelantan Herb Rice) which the early Chinese settlers along the Northern Malay Peninsula may have come into contact with. 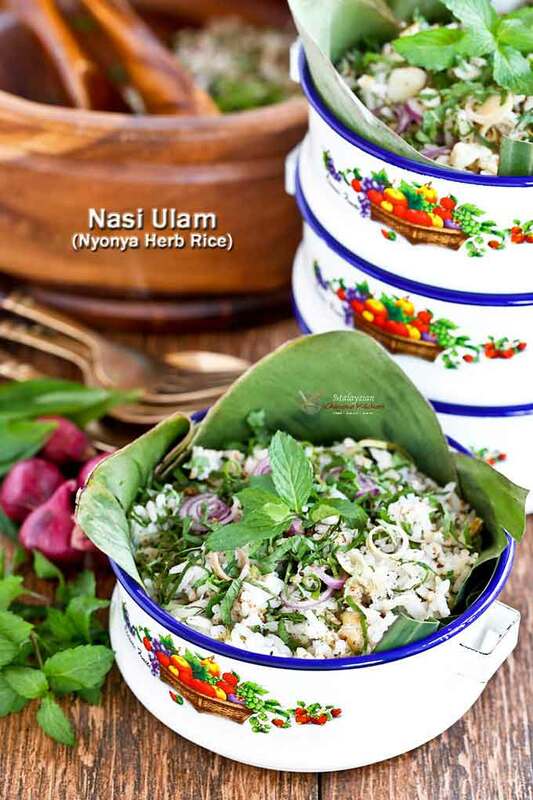 Unlike other kinds of flavored rice, Nasi Ulam is not so much eaten with curries that will overwhelm its herbal flavor. It is better suited for drier dishes like fried fish or chicken together with a healthy dose of Sambal Belacan. The spicy element can also be cut chili peppers thrown into the mix. No two Nasi Ulam are the same. Probably only three ingredients are constant – the rice, Kerisik (Fried Coconut Paste), and shallots. Commonly used protein include fish, salted fish, and dried shrimps. As for the herbs, depending on availability, the following may be used. 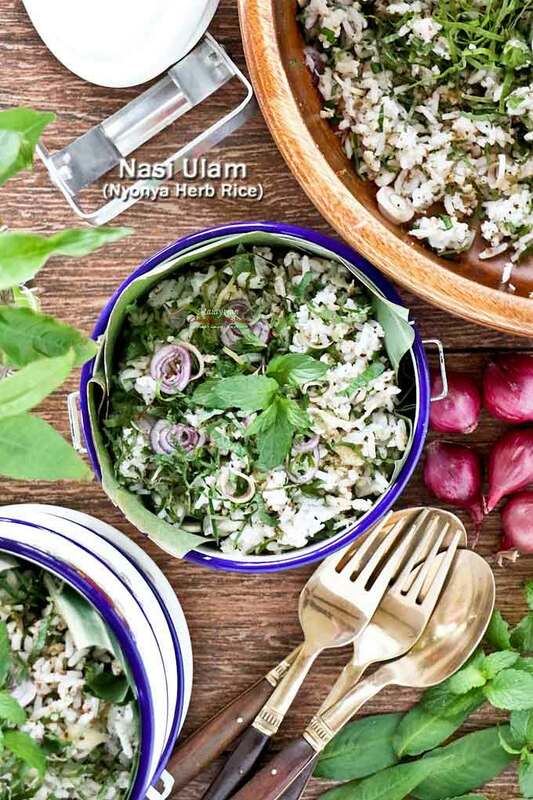 This Nasi Ulam recipe calls for ½ cup (50g) grated coconut to be made into Kerisik. 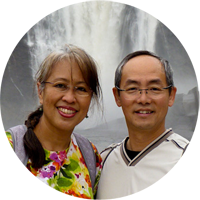 Please refer to my detailed video tutorial here for instructions –> Kerisik (Fried Coconut Paste). 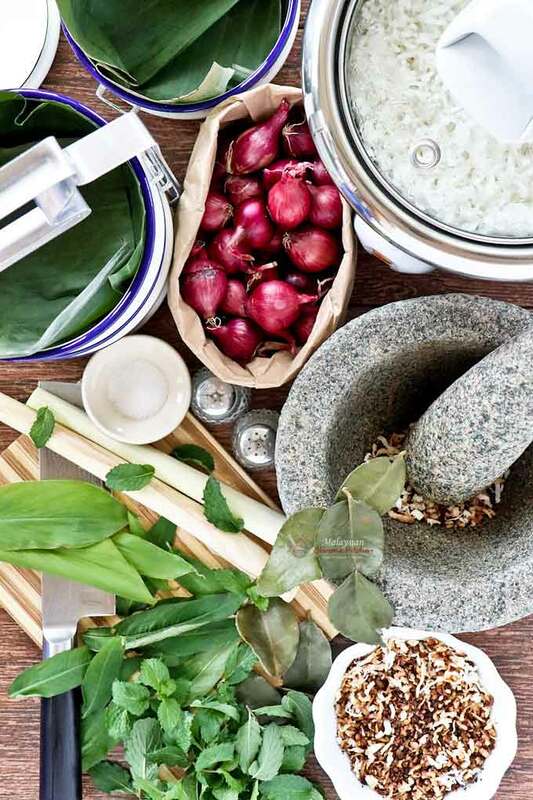 Listed below are a few dishes that would go well with Nasi Ulam. Ayam Panggang Kunyit (Grilled Turmeric Chicken).